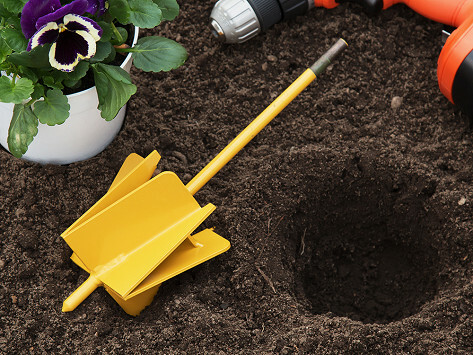 Fit this garden hole digger onto your power drill to dig faster and easier—and neater—than a shovel or trowel. The Made in the USA, powder-coated steel bit has angled blades that create a perfectly round, flat-bottomed hole to fit standard 4” or 6” potted plants. The drill bit compresses soil into the sides and bottom of the hole, so there’s no mound of dirt left over. Dimensions: 4 Inch Tool: 7" x 3" x 3"; 6 Inch Tool: 12" x 5" x 5"; Optional Extension: 25" x 1" x 1"
Weight: 4 Inch Tool: 1 lb. ; 6 Inch Tool: 2 lbs. ; Optional Extension: 1 lb. Best tool that I own. Dug fence posts and fence for my chickens. Worked fantastic. Works as advertised. Makes hole digging easier. No problem connecting to drill. The MAXBIT works in tilled or untilled soil, and makes holes to fit standard 4” or 6” potted plants. With the power of a drill doing the digging, planting a garden is easier—and faster—than ever.